Easy Video Transcoder is a frontend for Handbrake Cli. It can transcode from virtually any format to x264 in either MKV or MP4 containers. Primarily it was designed to be used as a post processor for TV recordings with NextPVR, although it can be used as a standalone application for batch transcoding or even single files as needed. It's especially useful when you want to quickly transcode multiple files of different resolution. This is the main feature of the application. 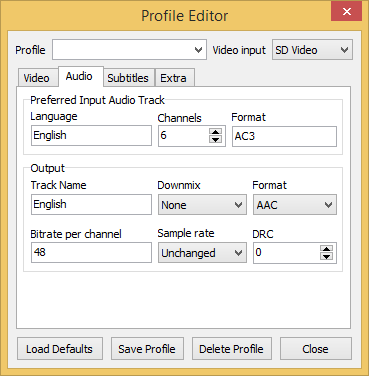 It's possible to set up profiles where the output is different depending on the input video resolution. So you set up the profile once and it can be reused time and again without having to change settings just because the input is slightly different. For example, say I want to output everything at max 576p. Anything lower will keep the same SD resolution as the input, but 720p or 1080p files will be resized. 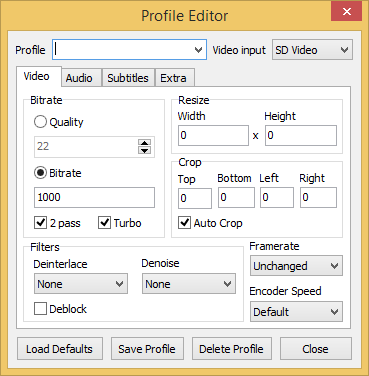 The video input (sub) profiles can be configured independantly so the output bitrate, resolution etc. and even the audio can be different depending on the input. See below for an example of how to set up a profile. 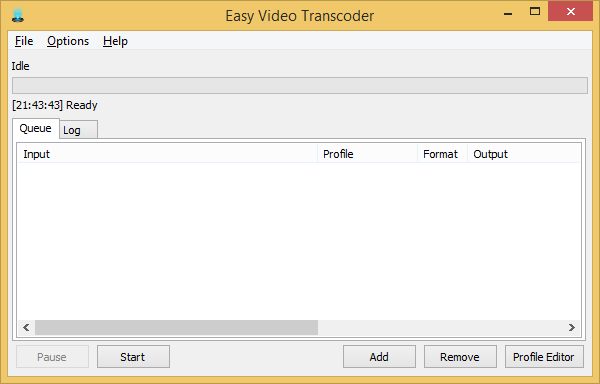 Easy Video Transcoder is available for Windows 32-bit. Note: The download links for Easy Video Transcoder have an interstitial ad. Simply wait 5 seconds until the skip button appears. Click skip and your download should then start automatically. Download the required software from the links above. EVT doesn't need to be installed. Just extract it to a convenient location on your Windows PC and run it. When you open the profile editor you're presented with the dialog below where you can change your desired output settings for SD video, ie. Any video with a resolution below 480p. Once you're happy with the settings, repeat the process for any of the input resolutions you'll be using with this profile. EVT parses the input file and automatically selects the video input profile to use based on the resolution. On the audio tab, you can select the preferred input audio track to use. EVT will parse the input and find the closest matching audio track, so the preferred track doesn't have to be exact. You can then set a name for your output track and various other settings, like the encoding format, number of channels etc. Note that the Bitrate is per channel and the total bitrate will be calculated by multiplying this figure by the actual number of channels in the output audio track. The subtitle settings are similar to the preferred audio. Enter a preferred language for your subtitle track and EVT will parse the input file and select the closest match. 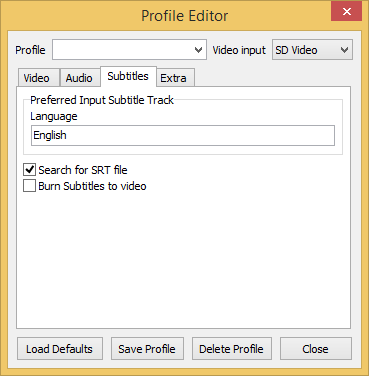 You can also choose to search for an external SRT file, which should have the same filename as the source video file. Selecting the burn option will actually encode the subtitle into the video picture, for use on devices that don't support subtitle tracks. Note that this only works with internal SSA subs for now. Once you have everything to your liking, enter a name and save the profile. You can edit this profile later by selecting it from the dropdown list. EVT has a built in default profile which is used if no profile is specified when using the commandline. To replace this profile, simply save your own with the name "Default" and EVT will use your custom default profile instead. Click add on the main window to open the dialog below. From here you can add a group of files that will be encoded using one profile. Browse to select your files. By default the output folder is the same as the source, but you can untick the box and change the output folder for all files in the group. Change the output format and profile and then click OK to add them to the queue. It's quick and easy to repeat this process for different groups of files that might use a different profile. Start processing the queue automatically. This is an example PostProcessing.bat script that should be placed in the NPVR script folder. cd /d "R:\Program Files (x86)\EasyVideoTranscoder"
Since NPVR only passes 1 filename at a time, this batch is overkill. 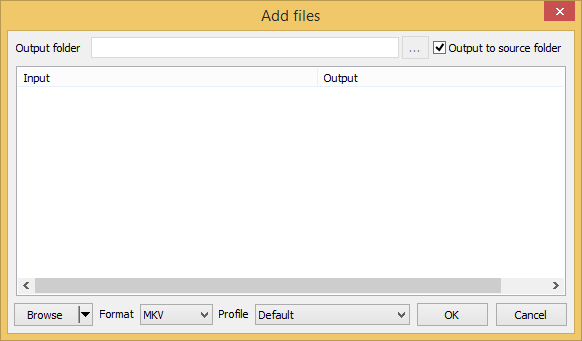 It is really handy though for dragging multiple files from Explorer onto the batch file. All the files will be processed and added to the EVT queue. Adding files via the commandline only creates a queue file that the main running instance of EVT will process. If EVT isn't running at that time, the queue file will be processed the next time you do run EVT. If you plan to use EVT with NextPVR, you should copy a shortcut to the startup folder and add the -start parameter. By doing this, EVT can automatically process the TV recordings as soon as they're finished recording.